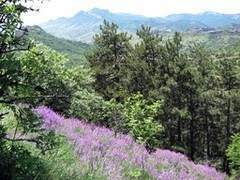 15 km from Sudak in the direction to Theodosia, in the most picturesque place, called by the travelers “Crimean Switzerland”, there is the Ravine of Kiziltash. 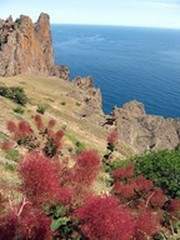 It is surrounded by huge red rocks, from which its name originates (Kiziltash in Tatar means “red stone”). According to the legend here, in VIII c. A. D. there used to a summer residence of the Archbishop of Surozh, the defender of the iconoduly St. Stephan of Surozh. 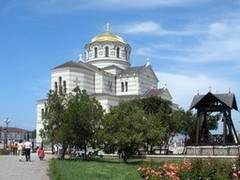 In honor of St. Stephan’s memory in 1858 by Archbishop of Kherson and Taurida Innocent the Kiziltash Monastery was found, but the place had been honored by the Christians long before the Monastery opening. 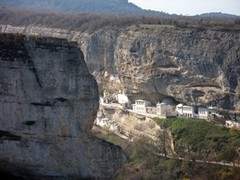 In the rock, near which the Monastery was, there is the cave with the spring, which is called the Sacred Cave. In 20ies of XIX c. a Tatar shepherd from the Village of Otyzy (at present the Village of Shchebetovka) was tending a flock of sheep not far from the rock. Having entered the cave, where he used to seek shelter from the bad weather, the shepherd saw the Icon of the Mother of God floating in the spring. Having taken the Icon with himself, the Tatar man on the way gave it to a Greek merchant from Theodosia, and the latter gave its image to church. Afterwards the Icon used to be in the Monastery, its present location is not known. Soon here settled down a Bulgarian girl Konstantina from the Village of Kishlav (at present the Village of Kurskoye, Belogorsk Region) and lived alone for seven or eight years. 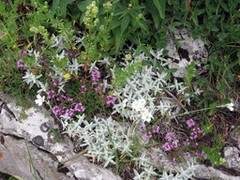 She had to leave Kiziltash, when, attracted by the rumors about the healing spring, here came two pilgrims and settled not far from the cave. Local residents did all possible donations, the first Monastery structures — cottages of wattle and daub — were built. In 1858 Hegumen Parthenius was appointed the father superior of Kiziltash Cenoby. All the contemporaries noted his amazing and various abilities, organizing as well as economic and administrative talent. 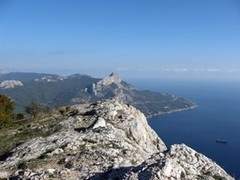 A famous writer, educator and traveler Yevgeniy Markov wrote in his “Sketches of Crimea”: “Father Parthenius’s energy, enterprise and economic experience made him in some way a leader of the local owners. He was good at everything: an architect, engineer, carpenter, stove setter, gardener, cattle-breeder, whatever you want…! Everybody asked him for a piece of advice, he was assigned with affairs”. Sadly the Hegumen had clashes with the local Tatars, who used to cut down the forest and to encroach on the Monastery property. 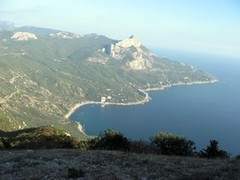 On August 21, 1866 Hegumen Parthenius went to Sudak, the next day he started back, but he was not back to the Monastery. The worst assumptions were confirmed: the Hegumen was shot dead on the forest road by three Tatars, the fourth one turned out to be a casual observer. The Hegumen’s body with a horse they burnt in the deep ravine. The crime was solved. By the sentence of the court martial three of the main accused were sentenced to death penalty and hanged in public in Theodosia. On the place of the Hegumen’s murder the monument was erected. By the decision of the Jubilee Assembly of Hierarchs of 2000 Hegumen Parthenius, a zealot and Christian martyr, was canonized. 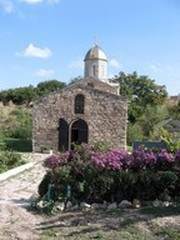 The Kiziltash Monastery distinguished itself with accomplishment and well organized economy, main buildings were erected, the terraces for the garden and the sulfuric spring were cleared. 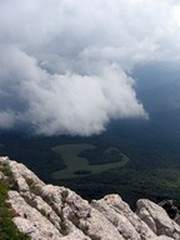 Complex and destructive events of the revolutions, the World and the Civil Wars influenced the fate of the Monastery, which was at the outskirts of the Russian Empire. In 1920 during the raid the Monastery was robbed, all the money and the Monastery documents were taken. Fortunately, there were no victims. 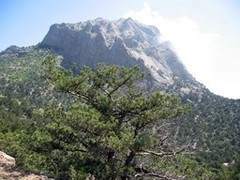 Judging by the number of people and their armament the robbers were so-called “the green”, who took cover in the mountains during the years of the Civil War. 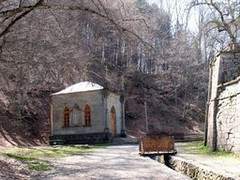 In 1923 the Kiziltash Monastery was closed. Here for all found the agricultural artel from the Village of Otuzy came, in the temples they established a club and a dormitory. They took down the domes off the churches. 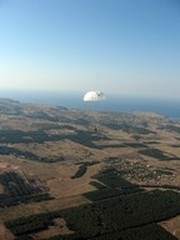 In the afterwar years on the territory of the Monastery the military-industrial complex made the arsenal for keeping nuclear arms meant for the ships and aviation of the Black Sea Fleet. In 1992 the nuclear supply was taken out of Kiziltash, but the military town still exists. On April 15th, 1997 at the meeting of the Holy Synod of the Ukrainian Orthodox Church they heard His Eminence Lazarus’s report about the opening of the Kiziltash Monastery in the name of Sainted Hierarch Stephan of Surozh. The Synod decided: to bless the opening of the Monastery, to appoint as its vicar Priest Nikolay Demyanyuk with making him a monk. — It is wonderful, but as sooon as the documents for the Monastery were signed, here a couple of eagles appeared. Now they live here, we have already got accustomed to them. And when we took to the rock top heavy oak crosses, we were afraid that we would fail to fix them and were very glad when we saw a small crack in the rock. We planned to make it deeper and, having inserted the cross root, to cement it. 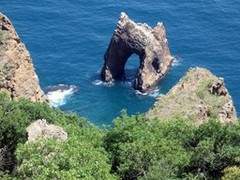 But contrary to the expectations, being only put for fitting, the rock as if had caught the cross root itself and taken it in itself. It was necessary to turn the cross a bit, but nobody could do it. The cross had joined the rock and had become the comprehensive whole. It is incredible but it is a fact, there were a lot of eyewitnesses. Previously four large crosses used to show the pilgrims the way to the monastery. Now there are two of them so far. Slowly, with a lot of efforts the Monastery is providing itself with the necessary conveniences. 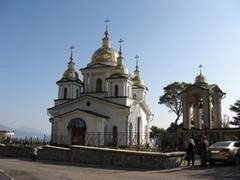 The Temple of the Patronage of the Mother of God in Sudak has obtained the status of its town residence. Now in the Kiziltash Monastery there are many particles of the holy relics. 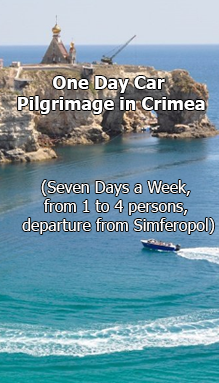 During their transporting by the disabled car in winter 1998 at the entrance to Crimea the relics of Sainted Hierarch Innocent of Kherson and Taurida, Venerable Gabriel of Athos and St. George the Victorious started to shed holy ointment. There are the Shroud of Christ and holy banners from the field temple of the 51st Lithuanian Regiment, which was accommodated in the Town of Simferopol.